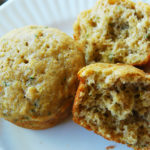 These are the best zucchini bread muffins! These zucchini bread muffins are light and airy, not dense and greasy. This recipe will turn out every time you make it! Whisk flour, cinnamon, nutmeg, salt, baking powder, and baking soda together. In a separate bowl, mix brown sugar and cream cheese together until smooth, this will help avoid cream cheese lumps. If there are lumps of cream cheese, it will still turn out fine. Gradually stir in buttermilk, oil, vanilla, and the eggs until well combined and smooth. Stir in zucchini until evenly distributed. Add dry ingredients and fold into wet ingredients until just combined. There will be some lumps. Divide evenly into 12 muffin cups (greased or lined), they will be almost full. See note for loaf recipe. Bake at 325 degrees F for 20-25 minutes for muffins. A toothpick should come out with slight crumbs clinging to it when baked through. To make zucchini bread instead of muffins, pour batter into one loaf pan (I use a 5 x 9 but any size similar will work) for 45-50 minutes.